Oakland builders, what are you thinking? Californians have always known we’re prone to earthquakes. The first Californians didn’t have our worries about it, though, because their structures were small and limber, no larger than a temescal sweathouse. Things changed when the missionaries of New Spain came into the country starting in the late 1700s. When the earthquake of 8 December 1812 took down the six-year-old stone church at San Juan Capistrano during the day’s first service, the forty natives who died were probably the first Californians ever, in thousands of years, to be killed by a structural collapse from an earthquake. To the Americans who succeeded the Spanish and Mexicans in the Bay area, earthquakes were well known. By my count, after Oakland incorporated in 1852 its inhabitants experienced thirteen notable earthquakes in the 54 years before 1906. As the American cities grew up around the Bay, builders sought to guard against quakes with thick walls of ever-stronger materials, culminating in concrete and steel. In the century since the 1906 San Francisco quake, engineers and architects have repeatedly improved the building codes. Today, buildings of almost any shape and size can be designed to withstand the largest earthquakes. That doesn’t mean we’ll trust them. Just as some of us get vertigo looking at photos of confident rock climbers, appearances can outweigh reason. 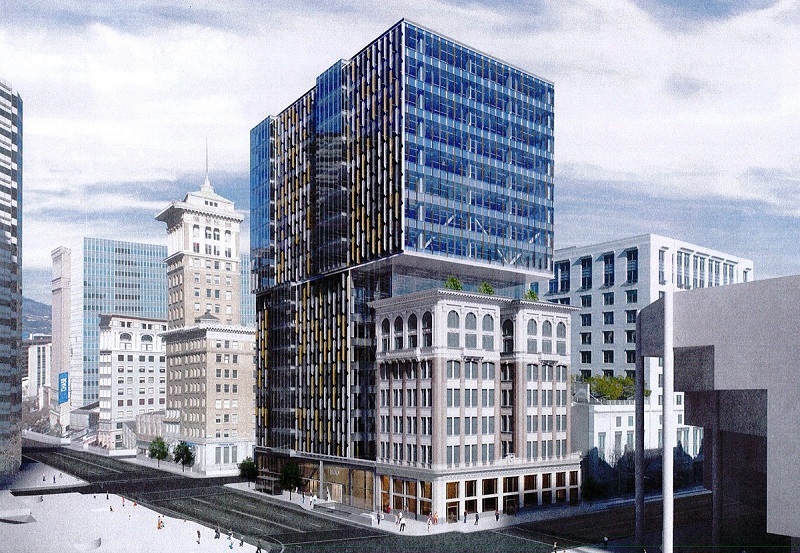 In recent months, two large buildings have been proposed in downtown Oakland that actually included overhangs. The one originally submitted for 325 22nd Street, facing the Ordway Building, looked like this, with a cantilevered soffit (as seen on SocketSite). The Planning Department didn’t like its bulkiness and awkward fit with its neighboring buildings, so that design was replaced with a more traditional set of boxes. The other building site is at 1100 Broadway, the lot next to the old Key System Building, both of which have been vacant since the 1989 earthquake. The latest project, from new owners Ellis Partners, is supposed to renovate and integrate with the Key Building, and this overbearing design is what they came up with last month. After getting feedback from planners and the Oakland Heritage Alliance, they submitted a revised design last week. They just love that looming cantilever — in fact they added more on other sides. Builders and planners are pros, so the overhangs are designed to hold. I understand that very well in my head. But how many of us will feel secure beneath — or inside — a cantilevered structure? I think these are obvious to most people, and that’s why, say, the new Kaiser hospital is reassuring in its continuity and regularity. The Transamerica Pyramid, even the new Salesforce Tower — reassuring. 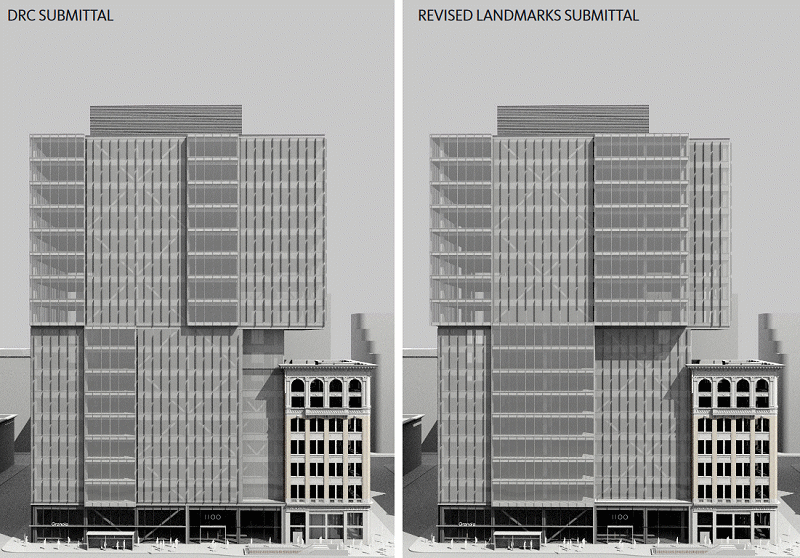 The design for 1100 Broadway is a textbook example of discontinuous and irregular, especially in its integration with the hundred-year-old, damaged Key System Building. 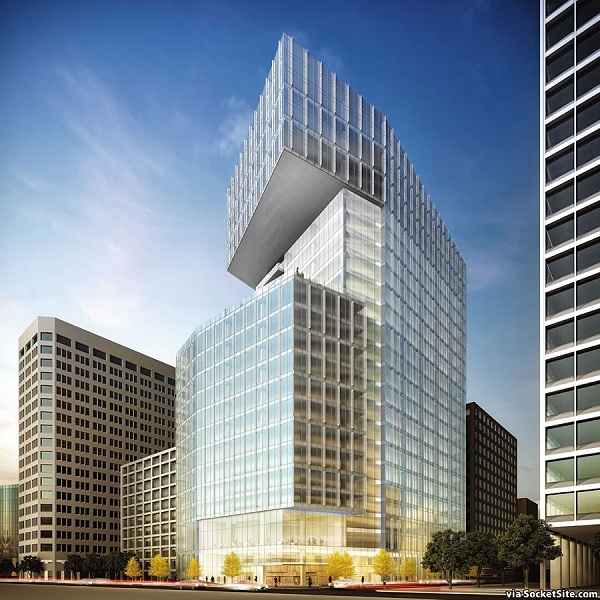 The NEHRP Concepts classify downtown Oakland office buildings in Seismic Design Category E, just short of the most stringent category used for hospitals, police and fire stations and other critical structures. After the East Bay’s next big earthquake, our perceptions will change. It’s important to think about that. Old-timers who were here for the Loma Prieta quake in 1989 can tell you. For years afterward, this fine old town will feel like Doctor Caligari’s city, angular and foreboding. When large quakes strike, buildings can sustain damage in an earthquake and then collapse in aftershocks, of which we will have plenty after a magnitude 6.7 event. I use that magnitude because the official odds are based on it, and they give the Hayward fault a one-in-three chance of producing one before the year 2043, within the useful life of these proposed buildings. No one alive has experienced such a quake in Oakland. Once we do, buildings with overhangs, even if they perform superbly, will no longer look vibrant or stylish — they’ll look deadly to our newly cautious eyes. And with that they’ll be effectively worthless, except maybe for low-income housing (which would be a good thing). And the city that thought such a building was a cool statement will be judged for that statement. I submit that builders and the city should be very conservative in not just their designs, but the appearance of their designs. This entry was posted on 12 June 2017 at 8:02 am and is filed under Earthquakes, Other topics. You can follow any responses to this entry through the RSS 2.0 feed. You can skip to the end and leave a response. Pinging is currently not allowed. In San Francisco, we took a tour of the Moscone Center South while it was under construction. There’s an alley on one side, with the Fifth Street parking garage across from it. The Center has about a dozen emergency exits facing the alley, and the original plan was to put an terrace that would overhang the alley. Wiser heads prevailed. Even so, the garage might collapse in a quake, blocking the exits.